But, one of my favorite things was to come home on a crisp afternoon and she would have the lamp on in the living room. We hardly EVER used our living room. The living room was for company only. So, that lamp wasn’t on very frequently. But, it was a cozy room. Kind of small – lots of dark colors. 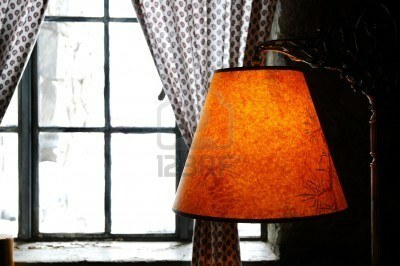 But she would have the lamp on – it sat right in front of the big windows and the drapes would be pulled back. It gave off such a glow, I loved it. I am still kind of in love with driving by people’s homes and seeing their drapes or blinds open with the glow of a lamp. Now, I’m not a big overhead light kind of girl. In fact, I had a friend over last night, and she asked me if we could even SEE with it being so dim. I like lamps. Thank you Ron Burgandy. But, today is one of those days. It’s cool out. It’s dark. It’s supposed to start raining later on. I will pick her up after school and then she and I will come home. I will turn on some lamps. It will be cozy inside. It will be warm. She and I will share a snack. I may make some tea or hot chocolate. And there will be the soft glow of a lamp. I can’t tell you how happy that makes me. And guess what? My little one is the exact same. She loves things cozy. She likes to snuggle, she likes to sip warm drinks, she loves the fireplace – and I love her for that. I love how each season defines my family. During the fall, we like the cozy things. During the summer we are a pool/lake family. But, most importantly – we are a family. Tonight, we will gather around a lamp and make memories.